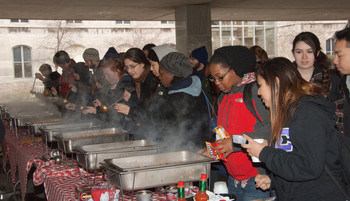 As part of the Winter Carnival celebration, the Office of Student Activities within Student Affairs hosts an annual chili cookoff competition open to students, staff and faculty. The first 10 recipes submitted will be entered into the competition. Those interested in submitting their recipes can do so through the Recipe Submission Form. Hungry customers taste the chili at last year’s chili cookoff. “The chili cookoff accomplishes exactly what Winter Carnival is meant for—getting students out of their dorms and apartments and onto campus, regardless of how cold it is,” says Ben Glidden, a senior public relations major and vice president of the Traditions Commission. This year’s chili cookoff will take place on Thursday, Feb. 27, on the HBC patio, beginning at 10:30 a.m. and ending when all the chili is gone. Three guest judges will pick the top three chili recipes and present awards to the winners between noon and 1 p.m.
Winter Carnival originated as a holiday before the onset of mid-term exams and helped to break up the winter months. The tradition dates back to 1933 and has included events such as the Snow Ball, snow-sculpting contest, chili cookoff and winter sports. For more information, contact Sarah Ross Cappella, associate director in Student Activities, at stactivities@syr.edu or 315.443.2718.